So the official FIFA 15 playable demo is out now on all major platforms in virtually all territories across the globe so to celebrate and get in the mood of things we decided to do our very own review on the new arrival. It’s for the Xbox 360 version which might not be to everyone’s taste as it’s not next-gen but it is still worth a watch. We took to YouTube and uploaded quite a few videos to our channel and you can watch our full review of the game demo in super high-definition below. Tell us what you think either in the comments box here on the official website or on the YouTube watch page. Whatever you decide to do we always like to get back to our viewers and readers and discuss the game in depth. In the footage above we play as the default Ultimate Team that EA have provided all players with and it includes the likes of Sergio Aguero, Lionel Messi and Marco Reus. We play against Argentinian side Boca Juniors in a friendly match and discuss the new features and all-round gameplay throughout. Hi! I played FIFA 15 Demo. I must say is the best football game yet. 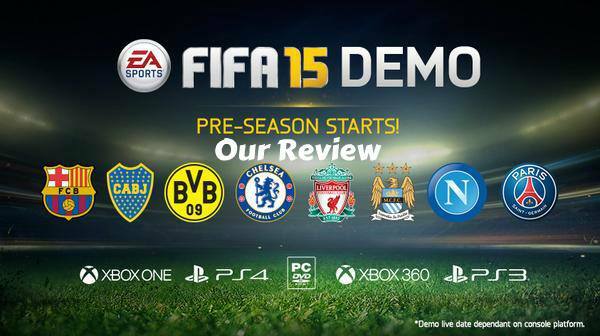 But to play you must met the FIFA 15 System Requirements.